It's that time again - Technique Junkie Newsletter Sneak Peeks! The April issue should be mailing soon - and you're gonna love what's inside this issue! If you're not familiar with the TJNL - check it out here, there's a few FREE tutorials here. There's always a few favorite techniques from each issue that I find myself using over and over - and Bingo Burst from the April issue is a great way to make creative backgrounds. I used my Radiant Rain Daubers as my ink for the Bingo Burst. 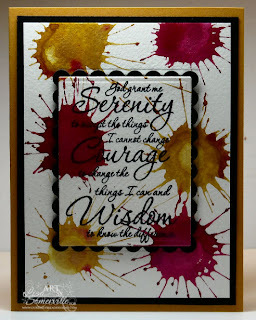 To create the card on the right, after stamping my sentiment and creating the Bingo Burst Background, I cut my sentiment from the center using my Nestabilities, then layered it on a Scallop cut from black card stock and layered that over the opening from the area I cut out. Love the splotch technique with the Radiant Rain. I just discovered these guys and now Luminarte, the company making this cool product is going out of business. Wahhhhhhhh!!! These are really kewl, need to try this!!!! Wow Lisa, that is a cool looking technique! 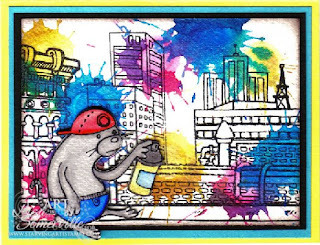 I especially love the Doodle Factory graffiti card! you always make such "COOL" cards! Maybe cuz you're such a COOL gal! ooohhh I like this technique!! can't wait to see what I need for this bg!! too fun! well, isn't that cool. Great cards. These are great! That top card is soooo perfect!